I’m about as paper-obsessed as they come and am constantly looking for new ways to incorporate it into my daily life. I love designing worksheets and calendars to stay organized, dreaming up fun party invites, and even creating my own gift wrap. Rather than keep these goodies all to myself, I wanted to create a space where I could share my ideas with others and thus, The Freebie Library was born. As a newsletter subscriber, you will receive full access to an assortment of awesome downloads to help you stay organized, host like a pro, and add an extra dose of pretty to your life. This includes all the downloads and printables seen on the blog, plus a bevy of exclusive downloads just for you. I’m excited to share my ideas with you and spend more time creating for the fun of it and plan to update the library 2-3 times each month. Happy first day of Spring! It’s currently raining outside and while I’m looking forward to the days when I can open the windows and let the cool breeze in, I also realize that it’s time to give my apartment a serious deep cleaning. Things have gotten quite disorganized around here after hunkering down through the winter months and let’s just say that I have more than one junk drawer that needs tending to. I’m pretty sure I’m not the only one who’s space could use a little TLC, so I created this simple cleaning checklist to help you stay on top of everything without getting overwhelmed. The goal is to tackle one item from each section every week starting now and in five weeks time your place will feel all shiny and new again. And since I’m all about positive reinforcement, I also included a place to list any new items you’d like to add to each space as a way to reward yourself for all that hard work and to keep things feeling fresh. That’s 24 little updates each year if you repeat this plan every season! Also, here are a few items that I currently have my eye on, as well as a few posts from around the web to help get you in the cleaning spirit (if there is such a thing). 1. The prettiest cleaning tools I’ve ever seen. 2. Chic organizers for sunglasses, jewelry and more! 3. A tutorial on how to create an asymmetrical spring floral arrangement. 4. The perfect hanger for tight closets. 5. A great roundup of eco-friendly cleaning supplies. 6. A laundry room redo that will make your jaw drop. 7. The best houseplants for your bathroom. 8. Helpful tips for making the most of small rooms. 9. Easy recipes for all-natural homemade cleaning supplies. 10. A simple label trick to give your kitchen and bathroom containers a major upgrade. The spring collection is now available and features over 20 fresh new designs to ease the transition into the warmer months ahead. My goal with this release was to create a collection of refined and effortless goods that you’ll want to grab over and over again. With most of my designs, I’m always looking for ways to represent my ideas as simply as possible while still being impactful. I found inspiration in a number of places and enjoyed sourcing new paper and envelope colors. I chose to screen print a majority of the items in an effort to enhance the minimal nature of each design and provide new creative opportunities (hello white ink!). In the end, these products came together very naturally and feel like a true reflection of what Evermore has evolved into. Next week I’ll be launching some new spring products and I wanted to share the inspiration behind it all. 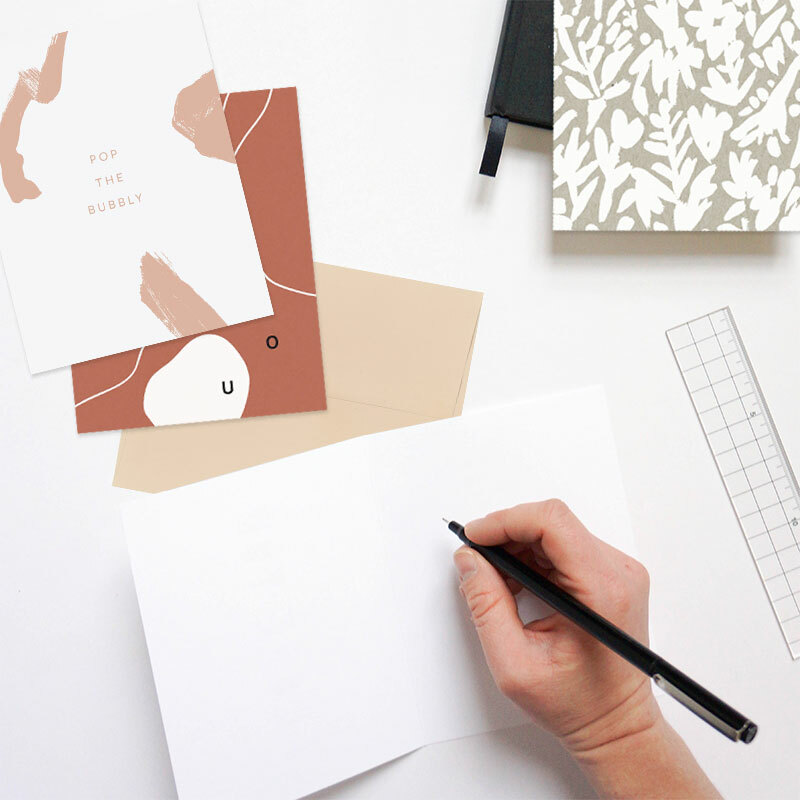 Lately, I’m all about effortless daily style and imperfect brush illustrations and have worked to create a thoughtful collection that will seamlessly fit into everyday life. I also aimed to create a color palette that feels fresh and will provide the perfect transition into springtime. I’ve had a thing for rust for some time now, but am recently drawn to dusty blues and pale grays. I can’t wait to reveal all the new items very soon! In the meantime, you can view more of my latest inspiration on Pinterest or see some behind the scenes shots on Instagram.